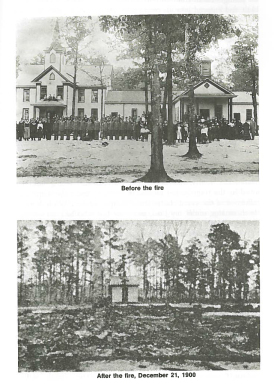 On December 20, 1900, a fire at Buies Creek Academy consumed every wooden campus building with the exception of a large tabernacle. The academy was the forerunner of Campbell University. It was founded as Baptist institution of higher learning in 1887 by James Archibald Campbell. In its first year, the academy only had an enrollment of 27. By 1898, the academy had three buildings and more than 60 students. Campus legend holds that the origin of the university’s rather unusual mascot, the Fighting Camel, can be traced to the fire. When local entrepreneur Zachary Taylor Kivett found Campbell moping after the blaze, he asked “Why are you in bed? I thought Campbells had humps on them.” Kivett pledged on the spot to build a new brick building, which was completed in 1903 and was named for him. It is the oldest building on the present campus. In 1926, the school became a junior college and its name changed to Campbell College in honor of its founder. Thirty-five years later, the school was promoted to a senior college, and in 1979, received its university status. Three years prior to officially becoming a university, the college opened Campbell School of Law.